The train ride was a great experience. Through half of the country we drove from Hat Yai to Bangkok where we arrived early this morning. At the train station we booked our third class ticket to Ayutthaya for 15 Baht. 15 minutes later we took seat in a crowded train in direction Ayutthaya. If you leave Bangkok by train you can see the people living next to the rails in tiny wooden houses surrounded by garbage. Those people have to work hard to be part of the community in Bangkok. Away from all the touristic places of this big city you can see the true face of Bangkok here. Most of the tourists avoid the train and so they can not see this side (which is also a part of Bangkok) of Thailand´s capital. After two hours we arrived in at the Ayutthaya train station (Phra Nakhon Si Ayutthaya) and took a small ferry to get to the city center. This old capital of the kingdom was destroyed by the Burmese but most of the temples and buildings are still in a good shape. We found a guesthouse next to the river Pak Sak with a small balcony so we had a great few to some of the old temples on the other side of the river. The rest of the day we had a long walk to visit all temples in walking distance like Wat Mahathat (Temple of the Great Relics). At night we went out to the night market of Ayutthaya for some great street food. Also a must do when you come to visit this city. 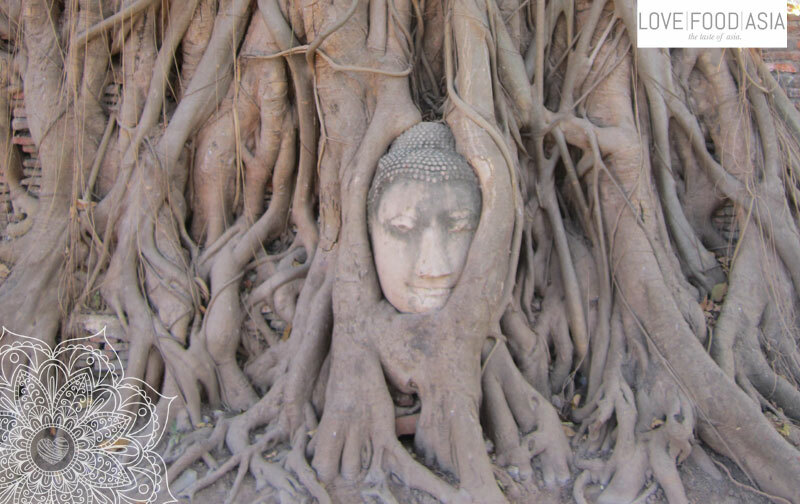 Tomorrow we planed to hire a bicycle to see all of the “must see” temples in Ayutthaya.